As of Sept. 30 the federal government’s total debt stood at $16.74 trillion, according to the Treasury Department’s monthly reckoning. Nearly all of it is subject to the statutory debt ceiling, which is currently set at a hair under $16.7 trillion; as a result, at the end of September there was just $25 million in unused debt capacity remaining. 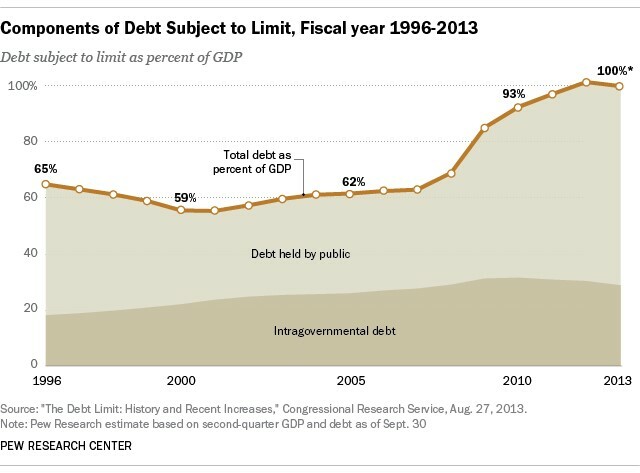 Though U.S. government debt is perhaps the most widely held class of security in the world, as of the end of September 28.4% of the debt (about $4.76 trillion) was owed to another arm of the federal government itself. The single biggest creditor, in fact, are Social Security’s two trust funds, which together held $2.76 trillion in special non-traded Treasury securities (16.5% of the total debt). (Social Security revenues exceeded benefit payments for many years; the surplus was required by law to be invested in Treasuries.) The Federal Reserve banks collectively held nearly $2.1 trillion worth of Treasuries (12.4% of the total debt) as of last week. 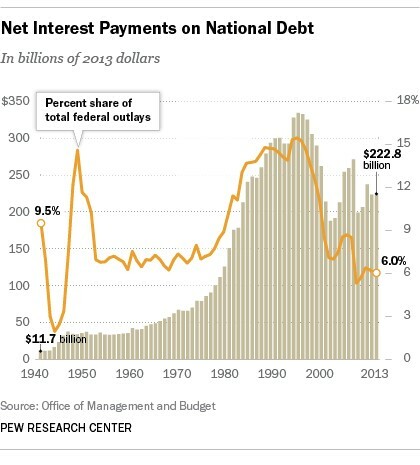 In fiscal 2013, which ended Sept. 30, net interest payments on the debt totaled $222.75 billion, or 6.23% of all federal outlays. (The government paid out an estimated $420.6 billion in interest, but that included interest credited to Social Security and other government trust funds, as well as a relatively small amount of offsetting investment income.) By comparison, debt service was more than 15% of federal outlays in the mid-1990s; the share has fallen partly because lower rates have held down interest payments, but also because outlays have risen substantially: up 39.4% over the past decade. Largely due to the Federal Reserve’s aggressive efforts to keep interest rates low, the U.S. government is paying historically low rates on its debt. 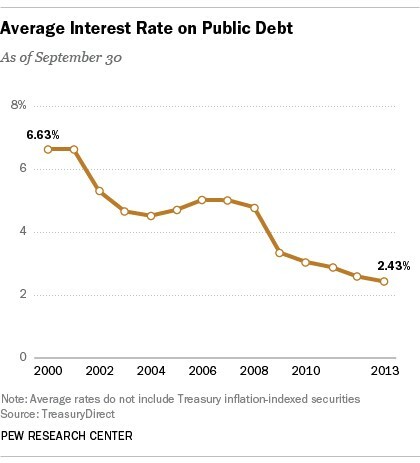 In fiscal 2013, according to the Treasury Department, the average interest rate on the public debt was 2.43%. Though you might think such low rates would dissuade investors from buying U.S. government debt, demand has until recently remained strong. But the ongoing debt crisis may be changing that, especially for short-term securities. BONUS FACT: Though many people may believe that “China owns our debt,” as of July (the latest month available) China’s Treasury holdings amounted to about $1.28 trillion, or 7.6% of the total debt. China is, however, the United States’ largest overseas creditor, ahead of Japan, which holds more than $1.1 trillion in Treasuries.